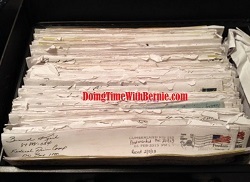 DoingTimeWithBernie.com: Felon on Probation Bernard Kerik's "Hired Guns" Timothy Parlatore and wife actually have guns and not afraid to use them to intimidate! Felon on Probation Bernard Kerik's "Hired Guns" Timothy Parlatore and wife actually have guns and not afraid to use them to intimidate! Felon on Probation, Bernard Kerik's "hired guns" aren't really "hired". The unscrupulous attorney, Timothy Payne Parlatore of the "virtual" law firm of FisherBroyles works pro bono on many cases for his bestie, Kerik. Actually, media whore, Timothy Parlatore, void of any real attorney skills, works for headlines and the spotlight. Parlatore is best known, not for winning cases, but losing them due to a techniques of threatening, harassing and intimidating his opposition. However, we've noticed a particular trend in social media at pivotal times in various cases involving felon on probation, Bernard Kerik and his "hired guns". You see Timothy Parlatore and his, "business manager" wife, Andrea Bereck Parlatore alias Carla Herschel Lilly actually have guns and apparently not afraid to display them seemingly to intimidate Plaintiffs in opposition. 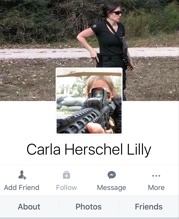 This past December, around Christmas time, on a pivotal day of many desperate filings in the "From Jailer to Jailed" Copyright Infringement case, Mrs. Parlatore changed her facebook from sweet Grinch Cakes and wedding photos to a profile filled with guns and threatening "subliminal" messages. We have learned Mrs. Parlatore had been taunting, on social media, the plaintiff and plaintiff's family during this time. These horrific images appeared allegedly aimed at the attention of the plaintiffs to intimidate, threaten and harass plaintiffs, witnesses and even the attorneys of this case. 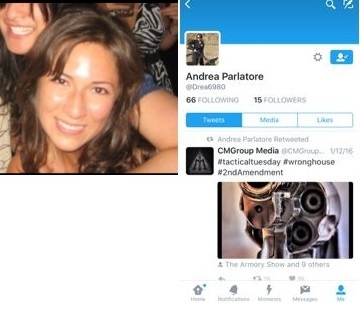 Mrs. Parlatore on Twitter known as @drea6980 went from a pretty face pic to profile of guns and hate. Is she coming undone? This disturbing behavior is not going unnoticed. We understand Timothy Parlatore is the subject of a disciplinary complaint in the Supreme Court, Appellate Division, First Judicial Department (Docket 2016.0151). We'll have to wait and see if there is any justice floating around the big apple. Some day, felon on probation, Bernard Kerik and his unscrupulous attorney, Timothy Parlatore and "business manager", Mrs. Andrea Bereck Parlatore Carla Herschel Lilly, may have to atone for their evil. One day they may go too far and the authorities may wished they had done the right thing at the right time to stop this alleged malicious untoward behavior.